In 2011 (from August to December 2011), the International Budget Partnership (IBP) conducted a comparative survey to measures and see the openness, transparency, participation and oversight of the budgets in 100 countries which includes Pakistan. 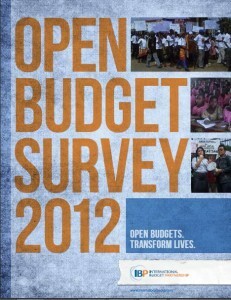 In 2012, the IBP published the Open Budget Survey (OBS) which contains the Open Budget Index (OBI). In 2008 and 2010, the IBP had also published the OBSs. From Pakistan, Omar Asghar Khan Development Foundation (OAKDF) was partner with the IBA. Through partners and individual researchers in each country, the IBA received responses against each question, which were calculated and quantified, and prepared the OBI. The OBI is basically an average of the quantified response for the 125 questions which relates to budget transparency, accountability and participation. In the OBI, each country is given a score from the range of 0 to 100 based on the criteria of availability to public and comprehensiveness of the eight key budget documents that governments’ have to produce and published at different stages of the budget cycle. The OBS also assesses opportunities for public participation in the budget cycle/process and the role played by institutions like National Accountability Bureaus in the budget making and oversight. The OBS 2012 shows that Pakistan received 58 score and is amongst those 36 countries which provide some information about the budget cycle and process, which does not give room to have ‘an informed budget debate’, which implies that in Pakistan there is little budget transparency. Pakistan shares the budget transparency characteristics with Afghanistan, Bangladesh, India, Nepal and Sri Lanka in the region. In both 2008 and 2010 OBSs, Pakistan had secured 38 score. The OBS reveals that Pakistan is one the seven countries which have improved budget transparency considerably from 2010 to 2012. In 2010, Pakistan was given 38 score. In 2012, it received 58 score mainly because of the increased comprehensiveness of the Green Book- a supporting document to the Executives’ budget proposal. The element of budget transparency also reflects from publishing specific budget documents at different stages of budget cycle which are Pre-Budget Statement, Executive Budget Proposal, Enacted Budget, Citizens Budget, In-Year Reports, Mid-Year Review, Year-End Report and Audit Report. Pakistan publishes the Pre-Budget Statement but that is used merely for internal use; the Executive Budget Proposal, Enacted Budget, In-Year Reports, Year-End Report and Audit Report are published and accessible to the public. Pakistan does not publish Citizens Budget and Mid-Year Review reports. Pakistan started publishing In-Year Reports, End-Year Report and Audit Reports in 2010. Pakistan has been found weak and poor in public budgeting: at federal, provincial and district levels. The executives (which includes the Federal Ministry of Finance, Federal Government Cabinet, Provincial Governments’ Cabinets, Finance and Planning Departments) do not formally engaged with the public during the budget making process- its making and execution; they do not articulate the budget and the process of formulating and executing it to the public; the public perspectives on budget priorities is difficult to be identified; feedback/input from the public is not gathered, nor are there any mechanisms; there is little chance that the Ministry of Finance or legislative committee hold public hearings on the individual budgets of central government administrative units (i.e. ministries, departments and agencies) in which testimony from the executive branch is heard; Pakistan is also performing poor on other indicators of budget transparency; however, somehow positive point is, the legislative committee holds public hearings on the macroeconomic and fiscal framework presented in the budget; in this regard, Pakistan secures B grade, which implies Pakistan yet has to progress little more for regularly holding public meetings. The OBS reveals that Pakistan has strong and independent audit institutions and gives 92 score to it; however, such compliment is still weak from many aspects; like all other institutions, the audit institutions in Pakistan work under the Prime Minister of Pakistan, and no institutions dare to ensure transparency, accountability and participation in the ‘current’ government’s policies, programmes and projects. 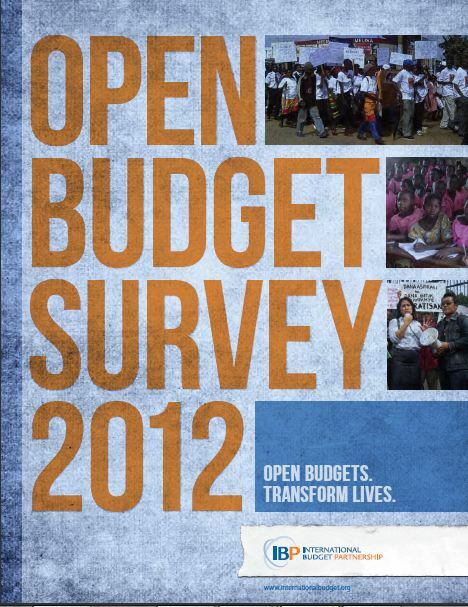 In Pakistan, there is extremely low public engagement in budgeting or budget making that is why it secures only 11 score on the OBI 2012.